The brand new Carrera set ‘DTM Speed Duel’ is all about excitement and speed. The 5.3-metre/17.38ft. 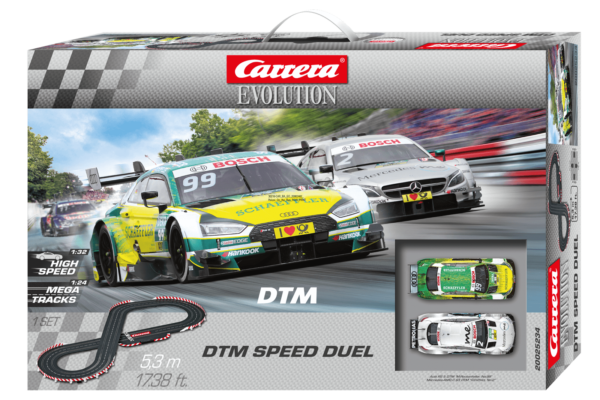 racetrack is sure to host countless close battles between Gary Paffett in the Mercedes AMG C 63 and Mike Rockenfeller in the Audi RS 5 DTM. The challenging circuit encourages DTM fans press the gas button on the handset to the limit. On this racetrack pure DTM emotion is guaranteed by ultra-fast sections, lap records and personal bests. Ultimately, the DTM driver at the top of the podium is decided by the Carrera drivers themselves.